Spent two nights at Slieve Bloom and it was my most enjoyable B&B experience in Ireland! Clean, comfortable, delicious breakfast options and fast internet for checking up on work in Canada. Location was fantastic with the main core a walkable distance. Alexandra was very charming and helpful with suggestions of local attractions and services. Highly recommend Slieve Bloom - you won’t be disappointed! I’ll definitively be back for my next Irish visit! First class b & b, made very welcome, very helpful with advice, good location, room large and comforable. Good and welcoming check-in, comfortable bed, delicious breakfast they even had vegan cheese, as I am a vegan, would have preferred vegan milk, but I also didn't ask. We stayed at Slieve Bloom during our honeymoon trip in Ireland recently and it was lovely! The room was comfortable and the breakfast was delicious! French press coffee and homemade soda bread! The hosts were super friendly and helpful. Would highly recommend staying here! Thanks again! Very friendly host the future Canadian lady of the house!, warm welcome and tasty breakfast. Water was cold when we got home and décor could do with an upgrade. Very reasonable price. Would recommend and would stay again. Very nice and comfortable room. Good to have a large and free parking space. The only think I did not like much was the communication with the managment during our stay by e-mail was quick and easy: neither city map provided nor possibilities to ask for suggestion. we stayed here four nights in early July,we used here as a base for the Dingle peninsula, the Ring of Kerry and the national park, it was also ideal for the short walk into the town centre, lovely spacious double bedroom with large ensuite shower, the breakfast was very good , and the proprietors were very attentive and friendly, the accommodation was very smart and spotlessly clean and if you are looking for a place to stay in Killarney I thoroughly recommend Slieve Bloom. We booked a double, given a family room which was cramped. We had to prebook breakfast the previous night. Food was pre cooked. Bacon was crisp whether you liked that way or not. Portions were not overly generous. Decor was 1950's and a bit tired. Could be lovely with an upgrade and a different management style. This is a lovely place, the staff is absolutely amazing very nice and helpful. we had booked a triple room and generously we were offer 2 rooms for the same price. Would definitely go back. The breakfast is very nice and the city centre very close. excellent stay, great location. Very clean with quality furnishing, polite efficient service good breakfast menu and a well cooked breakfast. Thoroughly enjoyed our stay and would go back to slieve bloom manor again, and would highly recommend this b&b. I wished they would take credit cards. They were there when we got there. The service was very sweet and helpful. The breakfast was yummy. Very nice rooms, Friendly staff, Close to everything, only 10 mins walk to town. Breakfast was top notch. Very tasty. Love there bathroom. Thanks for a very nice stay. Will definitely be back. Lovely room, great Irish breakfast and 10 min walked from Killarney centre. It was perfect accommodation to visit the Ring of Kerry. Wir wurden sehr freundlich aufgenommen und haben uns uns sehr wohl gefühlt. Very friendly, comfortable and clean. Good breakfast, good value for money. I can recomend Slieve Bloom Manor B&B. All was according the presentation and according our expectation - rooms, pleasant landlord, distance to center, breakfast. We had a good staying: the room was perfect, very well furnished and clean, the breakfast was good, and the house is near to the centre. A comfortable stay will visit again. Very nice rooms with good beds, shower working fine. The breakfast was excellent, and there are different breakfasts to choose from. Our room was quiet even if the main road is not far off. It's some distance away from the town centre about 15 minutes walking; but if you have bikes like us or a car then it's a perfect place to stay in Killarney, and at a reasonable price too. Very nice stay; very friendly service. Comfortable stay, very clean and nice decor and very accommodating hosts. Very good prices. Slieve Bloom Manor was an amazing stay. Very attentive and comfortable. Teresa helped in any way she could with directions, and information on the sites to see. We looked forward to the breakfasts, very satisfying. We loved the place.We would Definitely recommend ! Room was clean, bed linens and coverings were elegant. It is one flight stairs to the room, but what you trade off for in elevator you get back in excellent breakfast, gorgeous sitting room, small fridge use among guests, excellent service oriented owner. Really, it was a fabulous place to stay. Theresa went above and beyond to help us with whatever we needed...guidance to the best spots in Killarney National Park, a map for same, Advice about dining.....it was a warm and friendly place, but not intrusion into our space or vacation. Great Place to stay!! What a great place to stay,excellent breakfast and plenty of choice,room very clean and nice comfy bed,could not have wished for more.Would i recommend O YES but leave room for me,as in the words of Arne i will be back. Thank you, Teresa, for a pleasant stay. I love Killarney and your guesthouse was in a perfect location. The room and bed were very comfortable. Loved the sheets! Delicious breakfast and pleasant conversation. Would definitely stay again when overnighting in Killarney centre. Our hosts, Teresa & Brendan Clery, were most gracious, cheerful, &helpful!! The location was absolutely IDEAL...within wlalking distance of everywhere we wanted to go, yet quiet and peaceful at night. The accommodations were more than adequate and the breakfasts were superb. We had a nice stay in Slieve Bloom Manor! Every whish has been completed. Very good is that the Guesthause is so need of centre of Killarney! Thank you for everything ! Good location and price was good, the accomodation however needs to be updated it is very 80s, the lady we dealt with needs to communicate/engage better with her guests..
10 minute walk from the city centre, great family run place that is perfect for tourists to get a real feel for ireland. friendly owners and a great breakfast. Outstanding small hotel. 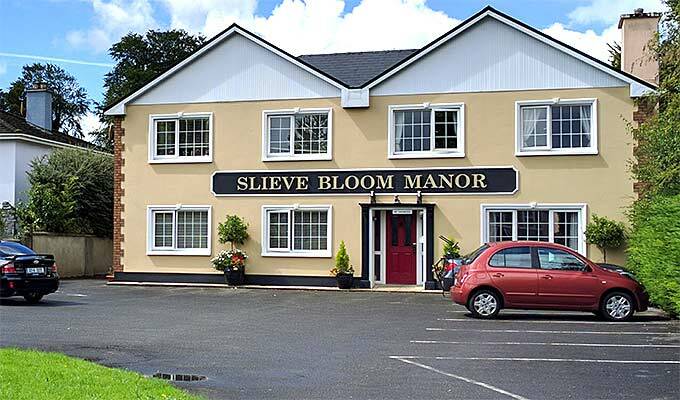 We enjoyed everything about our stay in Slieve Bloom Manor Guesthouse.It was very close to the town centre of Killarney just 5 minutes away. Perfect place to get around the ring of kerry.The breakfast was great. The room was large and spotless. would definietly stay again and wpould highly recommend it to friends. We had a great 3 days here .Teresa is such a good cook and she and her husband were very helpful and humourous We had a very comfortable room and appreciated the closeness to the centre and the very ample parking. We recently took a three night break in Killarney in order to climb Carrantuohill and spent a lovely three nights at Slieve Bloom Manor. A very warm welcome, clean comfortable rooms and accommodating hosts who arranged an early breakfast for us the day of our climb and offered drying facilities for our wet boots. A ten minute walk from Killarney town centre, I would highly recommend staying here - and as one of the most affordable guest houses I could find in Killarney, it is great value for money. I hope to visit again one day. I recently stayed for one night and I found it a very nice b&b The room was lovely and spacious and the breakfast was lovelyThe owners were very nice and friendly and very welcoming I would definitely stay here again!